The Irish Peatland Conservation Council are delighted to announce the appointment of our newest member of staff, Kate Macnamara. Kate is joining the IPCC team for the summer to welcome visitors and guide them through the peatland exhibition centre and wildlife gardens. She will also assist the Education Officer with school group and special interest group visits to the centre. Kate, who is from Naas, Co. Kildare, has just completed her first year of physiotherapy in Trinity College Dublin and is interested in specialising in paediatric physiotherapy. Kate says ‘this summer position will give me good experience interacting with adults and children’. 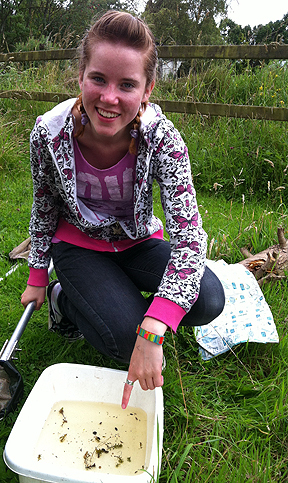 Kate has volunteered at the Bog of Allen Nature Centre on numerous occasions throughout the years. As one of IPCC’s youngest volunteers she has helped in field study work with students, with promotional material, in the wildlife gardens and greeting visitors. The Bog of Allen Nature Centre is open to the public Monday – Friday from 10am-4pm. The centre will also be open Saturday 23rd June from 10am-4pm. If you have a group that would like to visit the centre for a guided tour or for nature activities contact Kate and make a booking today on 045-860133. Discover and Learn more from this link. This entry was posted in News and tagged exhibitions, experience, guide, visitor. Bookmark the permalink.